International donors have warned Nepal that it must move to restore democracy to guarantee development. The warning came on Wednesday at the start of a two-day donors' conference in the capital, Kathmandu. European Union donors said: "The democratic process needs to be reactivated, beginning with a representative government." 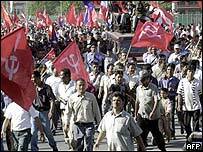 The meeting comes amid a long-running Maoist insurgency and a growing rift between the king and political parties. The BBC's Sushil Sharma in Kathmandu says the meeting is crucial for Nepal as it depends on foreign assistance for more than half of its budget. Although the donors pledged to continue assistance, they also called for an early restoration of democratic rule, a peaceful resolution of the eight-year Maoist insurgency and an improvement in the worsening human rights situation. The donor meeting includes the EU, Japan, the US and two international financial institutions, the Asian Development Bank and the World Bank. The EU said in its statement: "Representative democratic institutions and people's participation at the central and local level are key elements of the development partnership." 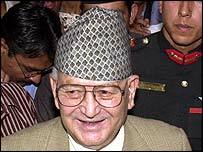 Nepal's prime minister, Surya Bahadur Thapa, has vowed to respond to the donors' concerns. Inaugurating the meeting, he said parliamentary elections would be held within a year. "With your understanding and support we are determined to restore peace and security and give momentum to development," Mr Thapa said. The administration has been at loggerheads with leading political parties since King Gyanendra sacked the elected government and assumed executive powers in October 2002. They have been engaged in a year of street demonstrations demanding either the re-instatement of the dissolved parliament or an all-party government comprising their nominees. The parties have boycotted the donors' meeting in protest at what they say is an unconstitutional government. Our correspondent says that although donors rejected the parties' request to postpone the meeting, a positive outcome in terms of aid commitment was less likely in view of the political crisis. The World Bank's vice president for South Asia, Praful Patel, told the forum that Nepal's partners were here to give the development process another chance. "Without peace there can be no meaningful development... Alarms have been sounded in the international community that Nepal may be heading the way of another failed state," Mr Patel said. Nepal is one of the poorest countries in the world and this meeting will decide aid over the next three years. More than 30 donor agencies are meeting government officials to consider the country's request for $556m a year in aid.